For a given driving distance, the chart displays the amount of journey time you would save by driving at different speeds, the general conclusion being that the amount of time you save is probably less than you think (or at least not enough to risk your life over). The chart itself is a bit confusing, with units changing between seconds, minutes, and hours. And it has a few small mathematical errors. But if you look beyond that, the question it raises is fascinating. What is the true cost-benefit trade-off of speeding? Speeding increases the risk of getting in a fatal accident, but that by itself does not make it a bad idea. We also risk our lives every time we cross the street. But most people aren’t too concerned about street-crossing because the risk is small and the benefit is high, arguably imperative for day-to-day life. On the other hand, most people would agree that trying to cross a 6-lane highway at rush hour would be a bad idea. The risk is high and there is probably nothing on the other side worth crossing for anyway. These two examples are extreme enough that there is no need to explicitly evaluate the cost-benefit trade-offs. For speeding, the answer is not so clear. The reason I find the question fascinating is because, unlike most trade-offs that involve risk to human life, the cost-benefit trade-off of speeding can be quantified. 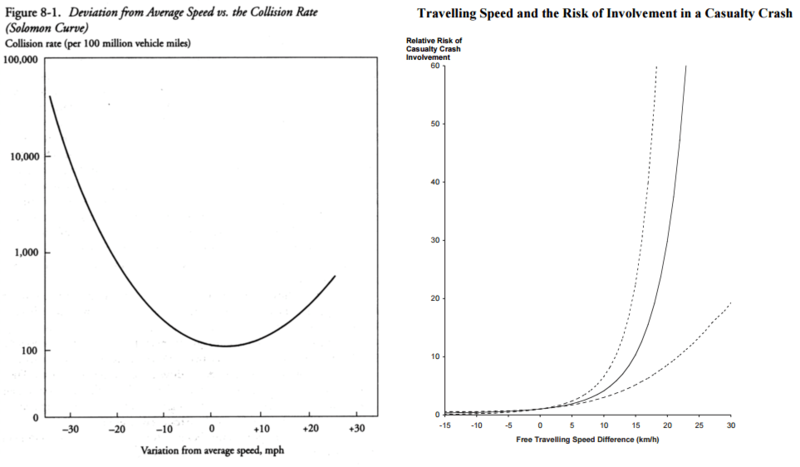 The benefit (time savings) and the cost (risking life) are both measured in the same units (time), so one way of looking at the decision to speed would be to compare: years of travel time saved by speeding vs. years of life cut short by speeding-related accidents. 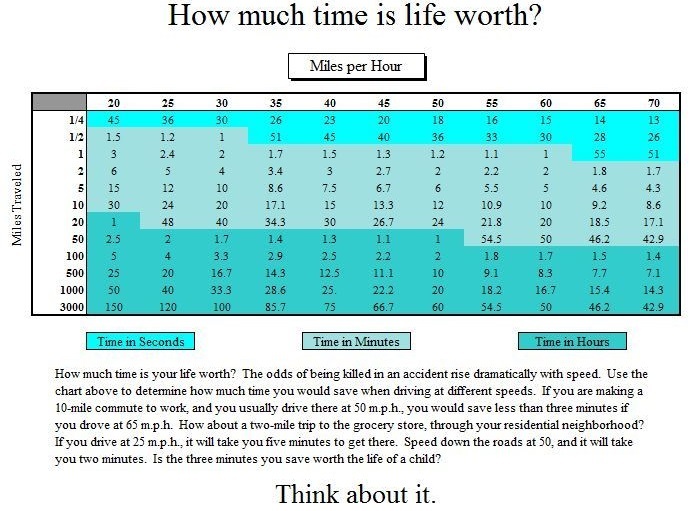 Based on 10 years of data from the Dept of Transportation, I put together some ballpark estimates for these two figures: the amount of time we save by speeding and total years of human life that have been lost (description of the calculation). The comparison is not exact (1 minute of travel time ≠ 1 minute of life), but it does give some context for thinking about the trade-off. The amount of time saved by speeding includes driver as well as passenger time. 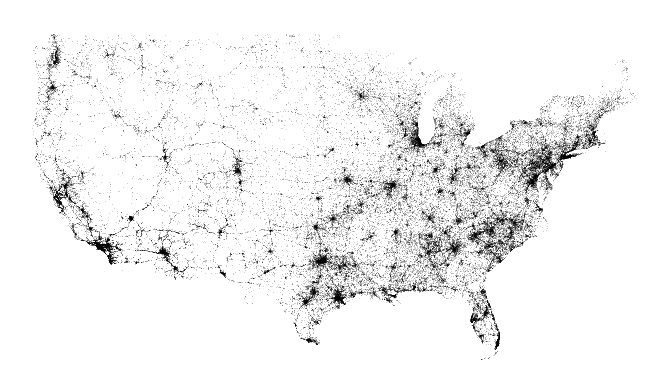 The lost human life figure includes drivers and passengers, as well as pedestrians, bicyclists, and anyone else who may have died as a result of the accident. Here is the breakdown. What else can we say about the profile of people who die in speeding-related accidents? Between 2004 and 2013, about 115,000 people died in speeding-related accidents, roughly one-third of all traffic accident fatalities. For comparison, the number of traffic accident deaths in which alcohol was involved is 124,000. 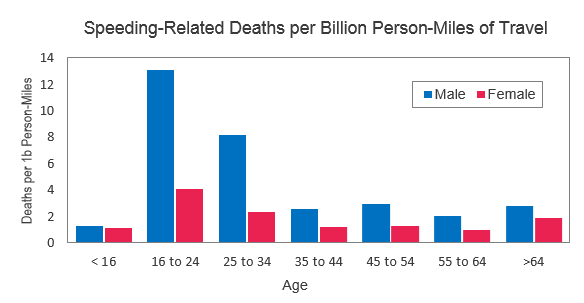 Here is how the 115,000 speeding-related deaths break down by age and gender. For every mile driven, people below the age of 35 are about 2.5 times more likely to die in a speeding-related accident compared to people 35 and older. The risk for males vs females is similar. Males are roughly 2.5 times more likely to die in a speeding-related accident compared to females. Driving fast is not necessarily dangerous. Driving faster than everyone else on the road is. You may be the best driver in the world. You’re still at risk of other people’s bad driving. Why do I mention this? Because it illustrates the fundamentally reason why speeding is risky, even for good drivers. Every time you encounter another vehicle on the road, there is some chance of an accident resulting. So the more cars you pass, the more chances you have of getting in an accident. If this is really true, shouldn’t the reverse also be true? Driving slower than traffic causes more vehicles you pass you, each of which should also pose some risk. So shouldn’t driving slow be just as risky as driving fast? The graph on the left is known as the Solomon Curve. In case you think I cherry picked it from some obscure source, see the Wikipedia page. The result has been replicated many times under many different circumstances. The Solomon Curve, shows the risk of getting in an accident as a function of vehicle speed relative to traffic. Notice the risk increases in both directions at roughly the same rate. i.e. Driving 10 mph slower than traffic has about the same accident risk as driving 10 mph faster than traffic. This curve has an intuitive explanation. The faster or slower you go relative to traffic, the more vehicles you are likely to pass (or are likely to pass you). As it turns out, the accident rates shown in the Solomon Curve are proportional to the number of vehicles you expect to pass at each speed. My interpretation: Driving is a game of chances in which you want as few “times at bat” as possible. Whether or not you’re a good driver, speeding is risky because each pass by another car has some probability of resulting in an accident, possibly through no fault of your own. Driving slower than traffic and driving faster than traffic may put you at the same risk of getting in an accident, but that doesn’t mean they are equally dangerous. The Solomon curve does not account for the severity of accidents. When you account for the fact that high speed crashes are more likely to be fatal, driving fast becomes far more dangerous. Accounting for accident severity, the curve on the right displays the relative likelihood of getting in a fatal car accident based on relative speed. As you can see, the risk accelerates quickly with speed (technically it . Driving 5 mph faster than traffic multiplies the risk of dying in an accident by 2. Driving 20 mph faster than traffic multiplies the risk by 35! Is there an argument that speeding is not a bad decision? Is it a mistake to assume that most people speed because they want to get somewhere faster? Not because they just want to go fast? The two charts above show correlation, not necessarily causation. Is there an argument that people who speed also happen to be more dangerous drivers? For a full explanation of where the “1 minute of saved time = 2.5 minutes of lost life” stat comes from, see: Digging into traffic safety data. Good analysis. Trying to think through the philosophical question of 1 minute of driving time vs 1 minute of life. If I could give up an hour of my life to avoid an hour sitting in traffic, it might be worth it. This article is fundamentally flawed. You’ve fallen for the misleading trap set up by the NHTSA and IIHS that includes everything under the sun for “speed related” collisions. Speeding has nothing to do with driving drunk. Driving without a seat belt on has nothing to do with speeding. However, those two things account for 87% or so of all “speed related” fatalities. This means all your figures are going to be off by close to 90%.